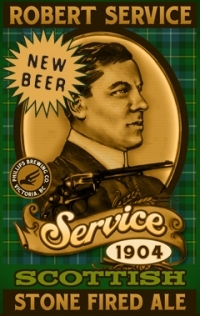 VICTORIA, BC – Publican Matt MacNeil has commissioned Phillips Brewing to create a beer to be served at his three pubs in honour of poet Robert Service. “This one is interesting as it requires making hot rocks and dumping them in the kettle to caramelize some of the sugars,” said Phillips, noting that’s traditionally how beer was made in wooden vessels that could not withstand a live flame under them. The process produces “full, rich, round, sweet flavours,” he said. Phillips says his latest ale starts with an initial sweetness with a hint of smoke and ends crisp and dry. Service 1904 is available exclusively at the Bard and Banker, Irish Times and Penny Farthing pubs in Victoria. I look forward to trying it out. Port Brewing in California has a beer they call simply “Hot Rocks” that uses the same method. Theirs is more in the style of the German “Stein Beer” but the wonderful caramel notes should be similar. As a seeker of quality stouts and porters this beer is the best I have tasted west of the Rockies from Colorado to Seattle. The trip to BC and Victoria uncovered this wonderful brew. The question is, how can we get some shipped to Denver?